Twi-hards got a present to commemorate Edward Cullen's 111th birthday, a new teaser for the final chapter of the "Twilight" saga. 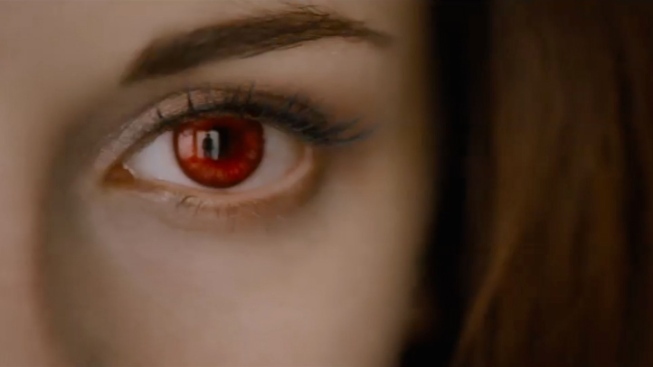 The trailer for "The Twilight Saga: Breaking: Dawn Part 2" features Bella (Kristen Stewart) in full vampire glory, with blood-red eyes, making giant leaps through the forest and mooning over her daughter. She and Edward (Robert Pattinson) seem very happy, even the jilted Jacob (Taylor Lautner) appears to have made peace with the way things have played out. But the Volturi are not pleased when word of the child reaches them. The coven of Italian vampires, led by Aro (Michael Sheen), heads off to the Pacific Northwest for a showdown with our heroes. "The Twilight Saga: Breaking: Dawn Part 2" opens Nov. 16.